It was a busy and happy weekend. There are no pictures because I left my camera at a friend's house where we attended a BBQ. Because he lives in southern Orange County, we figured we'd keep driving south to visit overnight with my in-laws in San Diego. The drive between LA and SD passes through some pretty landscape (and awful traffic), but it is more enjoyable during jacaranda season. I started to think about the two holidays in May, Mothers' Day and Memorial Day. Did you know that Mayan death rituals give the highest honors to warriors who die in battle AND mothers who die in childbirth? Both groups make the ultimate sacrifice in order to preserve their civilization. So how about we celebrate both holidays this year by giving all mothers in the US access to healthcare under the VA system, just like we do for veterans? Two fuchsia blossoms. The gardening center calls this type "voodoo". Sunset's western garden guide calls our area the "fuchsia belt". The dragon fruit farm experiment is not going well. If anything is forming, I can't see it. Bad Dad missed Iris' school's open house. Here's their homage to Wayne Thiebaud. Iris made the chocolate racetrack in the upper left and the cupcake in the bottom right. Visiting her classroom was like visiting a multicultural Lake Wobegon where all the kids are above average. Her teacher said that the only kids who do grade level work are her learning center kids. Most of them work above grade level. A handful of kids go to the learning center, where they work one-on-one or in small groups with credentialed teachers. That extra help and attention keep them on track. You look at the shabby exterior and chain link fence, and you don't know what magic they perform in there. Afterwards, we went to Rice Things and found half the school also had the same idea. The wait was long, but people were in high spirits. At the table next to us, we encountered a family speaking Japanese and English, followed by another one speaking Arabic and English, and then a group that spoke in Portuguese exclusively. That part is not Lake Wobegon. Then we stopped by Neighborhood Grinds to buy half price pastries after 8pm. The chocolate croissants are so good, I was surprised that they had any left after 8pm. I should have taken a picture before Bad Dad inhaled it. Hmm, he flew home, walked in the door without kissing me, and then ate my chocolate pastry. I have to go and discipline him. A friend and I were commmiserating about how the current economic policies favor debtors at the expense of savers. 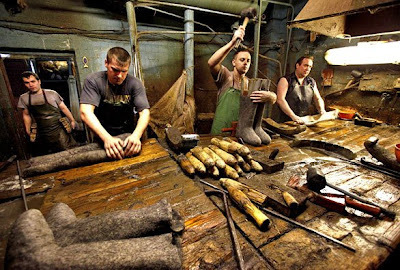 But I read this story about Boris Smorodov and his cadre of craftsmen/women who make valenki and I felt ashamed about my whining. Valenki are traditional Russian felt boots. Smorodeov noticed that modern machine-made ones were much stiffer than the ones he remembered from childhood. So he set out to interview elderly craftsmen and women to learn their traditional methods. He also bought up all the old valenki-production tools he could find. In the end, he decided to make flexible valenki the old-fashioned way, but make them more practical by adding latex soles. In Smorodov's tiny factory, entrepreneurship has done battle with gangsters and crooked officials, and traditions persist in the midst of what is supposed to have changed. It is a snapshot of what Russia has been, and of the tireless force of its people, even amid the vagaries of international economic tides. "I made a heap of money. By local standards, I was an oligarch," he says, laughing ruefully. "I thought, OK, I won't have to work again until my pension. But then the currency reforms began." In a string of monetary revaluations that marked Russian capitalism's birth in the early 1990s, Smorodov's savings evaporated. "I suffered three bankruptcies in a year and a half," Smorodov says. "People all around me were just committing suicide, hanging themselves. It was a time of suicide and bandits." 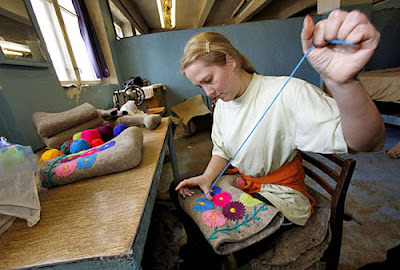 But Smoldorov and 25 employees soldier on, producing beautiful and useful wares that marry the ancient and the modern. I would buy his boots if he shipped to LA. Correction: I would buy the shoes if they were sold in LA. Wool felt boots are no more improbable than Uggs in LA. I smell an entrepreneurial opportunity here. Remember when I wrote that my workplace is closer to the epicenter than my home? This afternoon, we had a 4.0 centered less than 2 miles from my office. My office building is on rollers, which dissipates the energy safely, but several of us were slightly seasick. Maybe it was the rolling, maybe it has been the tension from frequent aftershocks in the past few days. I prepared an earthquake kit (actually one each for upstairs and downstairs). But Iris discovered the flashlights and other fun stuff. The kits just walked off and dissipated. Mark says that media coverage of hurricane Katrina taught him a powerful lesson. Dark people loot. Light people forage. When the big one hits, our earthquake kit is at the supermarket and pharmacy 500 feet from our house. Which is fine, except if he is away when the big one hits; I don't have the benefit of his light skin. And take a look at the earthquake damage at that supermarket the other night. If you click on the link above, you can see this excellent map of the faults in our local area. Actually, we live in about as safe an area as you can find within a short commute from work. 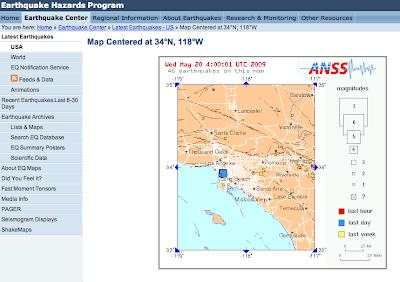 We are midway between the Palos Verdes and Inglewood faults, on one of the few protrusions of bedrock, not in a landslide or flash flood area, far from the tsunami zone, refineries that might blow up and combustible wildlands. It's not picturesque, but it is relatively safe. So why am I feeling so edgy? 4.7, epicenter ~10 km from our house, nearly shook my hot iron off the iron rest. I was sewing upstairs while Mark and Iris were watching TV downstairs. The shaking was more pronounced upstairs and I thought it was a much more major quake than they did. I ran outside, forgetting to unplug the iron. Mark went back inside to check for gas leaks and unplugged the iron. We don't see any visible damage. Some objects fell to the floor and my sewing supplies are piggly wiggly (as was the zipper insertion I was working on, but more on that later). Iris was very scared, but is now calm, though the aftershocks scared her. She says it was her first earthquake and it was very exciting. 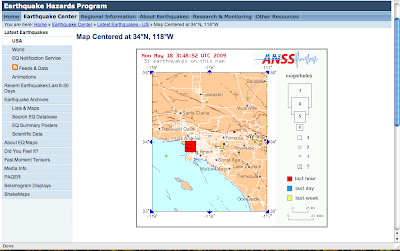 We've had swarms of earthquakes in SoCal lately. I have had to straighten out artwork hanging askew every few days in the past month. Living in LA is fun. In the light of day, we found a dozen or so places where things have fallen off high shelves. It's a good thing we keep heavy things down low and light things up high. I hung out with other parents in the schoolyard. Most of us work closer to the epicenter than we live and do not relish going in to clean up our offices. The Chino Hills earthquake last year moved my low bookcase, the one not strapped to the wall, about 4 inches. Check out the quake damage photos at the Daily Breeze. The places are between 0.1 and 1.0 miles from out house. So I feel fortunate we got off so lightly. "Living in LA is fun." said Bad Dad as we ate Japanese food for dinner, after eating Korean food for lunch and visiting Boyle Heights in the morning. It was like visiting Japan, Korea and Mexico in one day. While he was flying home Friday evening, Iris and I ate at King's Hawaiian in Torrance, which is like having a layover in Honolulu. We set off in the morning to the Sears repair center in Marina del Rey* because the Sears website said that the dryer part we needed to repair our Kenmore was in stock there. We checked the store hours online and planned to be there shortly after opening. What the website didn't say was that Sears closed that service center May 15, 2009. Yup, we missed it by one day. The guy packing up the store told us the phone number and address of the service center in Boyle Heights (East Los Angeles) and off we went. The Sears was like a giant beacon in the neighborhood. Inside, the store was like a time machine, reminding Mark of the main Sears in San Diego in the 1970s. A sign outside the repair center said, "If you can bring it in, we can repair it." A sign as you enter the main store said, "We are here to stay." We hope Sears really means it. The parking lot hosted several Mexican-style food and juice carts. Heading back to the freeway, we drove by the toy and fashion districts. Another day, we have to go back there. It looked so interesting. Later in the afternoon, we stopped by Books Sanseido where I got these two books. Check out this how-to book for recycling t-shirts and men's dress shirts into cutting edge fashions. 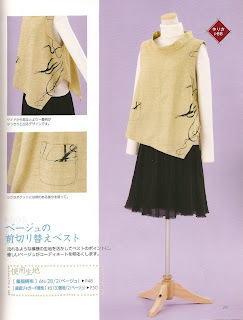 The cover shows a Trompe-l'œil dress made from a large t-shirt sewn to a tank top. I like this bustle shirt made from two large t-shirts. You can see the back bustle in this photo. Two men's dress shirts make up this blouse. Look at the cupcake balanced on her shoulder. This sundress uses one shirt for the dress, and the bottom part of the body from three more for the ruffles. You can make other projects with the remainder of the other three shirts or use other yardage. There's the cupcake again. Shirt collars make this bag. 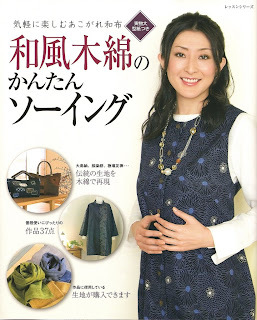 I also bought this periodical which has both patterns and a fabric catalog. If you blow up the image, you can see that it says sewing instructions are on page 74 and fabric information is on page 48. 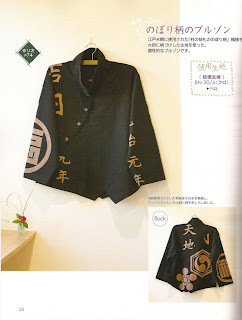 The fabrics used in the magazine are mostly 100% cotton, 110 cm wide and about 2000 yen per yard. 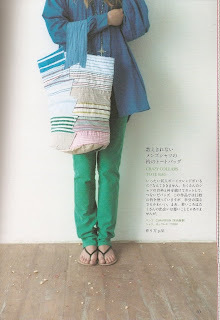 Full -sized patterns are included in a tear out section in the back of the magazine. They made this top in two fabrics, one plain, and this printed one. * I suppose visiting Marina del Rey was like visiting another country for white people, or maybe time traveling to 1970s demographics. Mad Hatter over at Sew Mad published these photos earlier this week for Projekt Farbe. Don't you just love the headlamp on that bicycle? This week feels like a marathon. But I know Bad Dad is the one that is working through the night, one night after another. That's harder than doing both school dropoff and pickup (and working in between) all week. I rode my bike to work twice in celebration of national Bike to Work Week. On Tuesday, we bought 10% more bagels than the prior year and still had to run out for more! Participation this year is up 15% over a year ago. That's one positive indicator for our country. Oddly, if we consume less gasoline, then we spend less money and the GDP and tax receipts go down. Breathing clean air and exercising has no economic value using our current system of accounting. We had a good turn out in LA, albeit not as good as San Francisco, where the SF Bay Guardian reported that bicycles outnumbered cars by 2 to 1 along Market Street! Imagine if we claimed Wilshire and other arterials. We'd be able to get around town so much faster than the current gridlock. We'd get a nice tan while doing it, too. 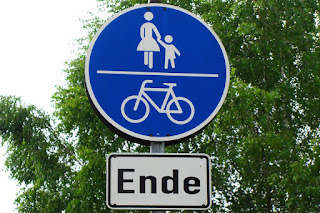 There are lots more colorful pictures over at Sew Mad and some shots of bicycle & pedestrian paths. 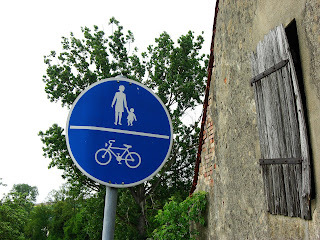 We corresponded and we think that I even used to ride a bicycle between my host family's house and the community swimming pool on the path that runs by her house. Congratulations to the official winners of the 2009 Bike To Work Challenge -- Northrop Grumman !!!!! A big THANKS to Aerospace, Boeing, Electronic Arts, Equity Office / Howard Hughes Center, DirecTV, Los Angeles Air Force Base, Los Angeles World Airports, Northrop-Grumman, and Raytheon for donating the awesome giveaways!!! We were so impressed with all the motivated cyclists that participated in this event and are looking forward to the 2010 Bike To Work Challenge!!!! Thanks to one and all for making the 2009 Bike To Work Week such a success!!! There is no shame in losing by such small margins to companies with 10 times as many employees. I am happy to see the number of participants grow year by year. Don't forget the nationwide event, Bike to Work Day on May 14. The 15th annual Bike to Work Day is coming on Thursday, May 14, 2009. We expect a record number of participants to enjoy a relaxing, healthy, green bicycle ride to work. Pledge Online… and, be entered to win fabulous prizes, including an electric bike from Currie Technologies! Aerospace will be co-hosting a Pit-Stop at the El Segundo/Nash Green Line Station on Thursday, May 14 from 6 a.m to 9:30 a.m. in honor of the 15th annual Bike to Work Day. All cyclists are invited to stop by for refreshments and free giveaways! ...when I was not running around, preparing for a week as a single parent. I am knitting Norah Gaughan's Manon pattern. The striped hankerchief linen underneath will become a sleeveless blouse and full skirt; patterns for those are still to be determined, TBD. I will post a few possible candidates next weekend. Iris told me that her favorite part about school (besides leaving) is walking to school with me. She says it is like having a private science tutor. She saves up questions and we talk over breakfast, all the way to school, and sometimes continue in the playground. This week's topics include absolute zero and quantum mechanical zero point energy. No kidding. The other day, she stumped me with a question about how a radio works. Any EEs want to chime in and save me? At night, I have been reading The Organization Man by William H. Whyte. Whyte definitely has a bias towards liberal arts (vs. vocational) training. (He is neutral about science departments.) Aspects of the book are clearly dated and a product of his time. Workers are always white males and their spouses are always white females. Overall, I find the book timeless and timely. He warned about how group think can run a company into the ground more than 50 years before AIG and this global economic meltdown. I wrote earlier that I have both a BA and a BS from UC Berkeley. Earning a BA had a greater impact upon me than I realized at the time. Read Why Study the Liberal Arts? (link via James Fallows' blog discussion about Chinese vs. non-Chinese education) for Berkeley's philosophy about "breadth and depth". The history classes I took to satisfy the requirement for an area of concentration outside of one's major gave me a framework to understand the human world around me. I am deeply grateful for that experience. To be liberally educated is to be transformed. A liberal arts education frees your mind and helps you connect dots you never noticed before, so you can put your own field of study into a broader context. It enables you to form opinions and judgments, rather than defer to an outside authority. I describe my education to others as a liberal arts education in science. That is, mathematics is the language of science and chemistry is the "central science" that bridges the physical and life sciences. Only in graduate school did I pick a specialization. I also transferred from a physical chemistry program into an interdisciplinary program with physics at the end of my second year. I appealed to Carl Wieman about the wacky value of g, the acceleration due to gravity, in Iris' homework. He told me that we have bigger fish to fry than worrying about non-linearity and a factor of 2 or so in g. Carl has been writing about A Scientific Approach to Science Education on his blog. It's an excellent series and I recommend reading it in its entirety, including comments. Read his description of physics as a framework for understanding nature. My research group and others have developed survey instruments that can measure where on this scale a person’s beliefs lie. What do we mean by a “novice” in this context? Adapting the characterization developed by David Hammer, novices see the content of physics instruction as isolated pieces of information— handed down by an authority and disconnected from the world around them — that they can only learn by memorization. To the novice, scientific problem-solving is just matching the pattern of the problem to certain memorized recipes. Experts—i.e., physicists—see physics as a coherent structure of concepts that describe nature and that have been established by experiment. Expert problem-solving involves employing systematic, concept-based, and widely applicable strategies. Since this includes being applicable in completely new situations, this strategy is much more useful than the novice problem-solving approach. Once you develop the tools to measure where people’s beliefs lie on this expert-to-novice scale, you can see how students’ beliefs change as a result of their courses. What you would expect, or at least hope, is that students would begin their college physics course somewhere on the novice side of the scale and that after completing the course they would have become more expert-like in their beliefs. What the data say is just the opposite. On average, students have more novicelike beliefs after they have completed an introductory physics course than they had when they started; this was found for nearly every introductory course measured. More recently, my group started looking at beliefs about chemistry. If anything, the effect of taking an introductory college chemistry course is even worse than for taking physics. So we are faced with another puzzle about traditional science instruction. This instruction is explicitly built around teaching concepts and is being provided by instructors who, at least at the college level, are unquestionably experts in the subject. And yet their students are not learning concepts, and they are acquiring novice beliefs about the subject. How can this be? Cognitive scientists have spent a lot of time studying what constitutes expert competence in any discipline, and they have found a few basic components. The May 2009 issue of Physics Today ran David Mermin's "What's bad about this habit?" about the dangers of confusing a theoretical/conceptual framework that explains the observable world with reality. Lots of food (framework) for thought. But off to bed. I need to ride my bike in to work tomorrow. The Aerospace Employees Association (AEA) Cycling/Bike Commuter Club and Aerospace Commuter Services are sponsoring a challenge to see who can bring in the most bicycle commuters. All cyclists who ride their bikes to work that day, regardless of starting point or whether they rode with the group, will receive a continental breakfast, a T-shirt, and promotional items. Cyclists arriving to work should go to The Aerospace Corporation's Visitor Lot/Gate C (located on Douglas Street), turn left before the security guard shack, and sign in anytime between 6 a.m. and 10 a.m. to receive your cycling rewards. In addition, Los Angeles World Airports is holding a Westside Welcome Station/Pit Stop at World Way West for all Bike to Work Challenge participants riding in from the Westside. Beach cities riders can make a pit stop and join others continuing the ride to the Aerospace Welcome Station. Once again, I did not make elastic pant leg protectors for riders. Nor did I post a tutorial showing how to make your own custom-sized elastic and velcro pant leg protectors. Sigh. Maybe next time. Go get your bike ready and join me tomorrow. If you ride in and catch me at the breakfast station, give me your postal address and I will send you an elastic pant leg protector when I finally get around to sewing them. My two daughters are both compulsive readers, gobbling up everything in their path. As a result, they both have very large vocabularies are very well informed about a range of things. I love it--instead of watching TV and getting dumb, they're reading, and getting smart. Mostly they read novels, but it's amazing how much about the real world you can learn from reading fiction. One thing I'm sorry about is that they don't seem to be assimilating any basic science literacy from their reading. So my question for you, or maybe for your blog readers, is can you recommend any books that kids will love that contain science or math? They could be fiction or nonfiction, but if nonfiction, they have to be fun to read -- not too rinkydink on the one hand, nor too dry on the other. They don't have to be great literature, just fun for 10-16 year-olds to read. I want to tap in that ability (and willingness) they have to effortlessly vacuum up knowledge. It would be cool if they knew as much about geology as they know about English folklore of magical creatures. The one perfect example I can think of is The Phantom Tollbooth. I'd like 50 more books like that one. We were discussing this in light of The Faulty Thermodynamics of Children's Stories. I've always wondered about the three bowls of porridge in Goldilocks and the Three Bears. Why is Mama Bear's porridge the coldest? Doesn't that mean she has the smallest bowl? The only way that the story can make sense is if, for some reason, the Mama Bear has the smallest portion of porridge. In which case, this is a story with a very different moral than the original--it's a story about the oppression of the Mama Bear, either because the patriarchy is forcing her to eat only the scraps left behind after her husband and child have had their fill, or because the unhealthy woodland media culture has saddled her with a negative body image, leading to an eating disorder. Or, perhaps, it should have been a tipoff to Goldilocks that the ordinary rules of Physics do not apply in that house. Never mind the nap; she should get the hell out of there ASAP. Leave your book recommendations in the comments. To get the ball rolling, how about Mr Tompkins in Wonderland and Mr Tompkins Explores the Atom for Physics? I tried to read Flatland - A romance of many dimensions by Edwin A. Abbott because Rudy Rucker referred to it so extensively, but I found the language difficult (for a teen). Uncertain Principles picked up this thread, and there are more suggestions over in his comments. 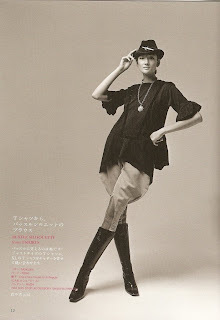 I made another version of Vogue 1790A. I was only partially successful grading the pattern size upward. Note how well it combines with the Vera jacket I knit last year. The magic waistband just looks too shirred for my taste. The pockets also pucker slightly. The back looks better, but I should have taken the back up a little bit. I also had a refashion mishap with this tunic I found at Goodwill. Originally, I had planned to use the Shiva Paintstiks with a rubbing plate. I practiced with scraps and it looked great. When I tried it on the front placket, all I could see were the impressions of the seam allowances. Dyesticks are permanent, so I had to improvise quickly. I colored the entire placket and collar band with irridescent magenta. Then I painted a design inspired by mudcloth using Lumiere irridescent gold paint. Remember when I took a fabric collage class with Cindy Rinne? She showed me that the void in my life was actually a #2 Filbert brush. It combines the best of flat, angled and round paintbrushes. Even with shaky hands after two cups of coffee, the motifs look very satisfactory. You can make your own virtual mudcloth with this the Smithsonian Institution's mudcloth applet. They call this design the one legged girl with little stars. One leg is rather macabre, so I gave her two legs. Many sewing blogs have been posting their Spring/Summer sewing plans. I have finished two skirts and refashioned a pair of pants into shorts. I knit a cardigan and plan to knit one more. I plan to refashion another pair of (pale green) pants by dyeing it olive green. I bought some black/white/yellow stretch woven to sew mommy and me shift dresses. But Iris is on probation for the way she treats her clothes. I told her that I am on strike (not making her any more clothes) until she treats her clothes with more respect. That got her attention. She might earn that shift dress yet. 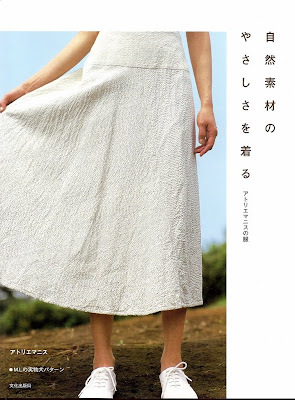 If I can get over the chronic infections and fatigue plaguing me, I would like to sew two two-piece dresses, a design from a Japanese pattern book in black/white striped hankerchief linen and another from Burda BWOF 05-2009-115A and BWOF 05-2009-116A. I also bought 4 t-shirts, 2 blouses, a pair of pants and black sandals to replace the very worn shoes of summer. This weekend, I also entered all my sewing patterns into a spreadsheet. The verdict? Mark has more DVDs than I have patterns. However, watching a DVD is less of a time commitment than most sewing projects. We will both probably die before we get around to using/viewing our entire collections. Reviewing them is like watching a filmstrip of fashions from the 1980s through present. 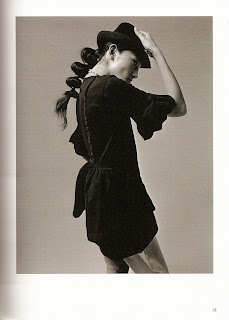 How is it that I have 17 Issey Miyake patterns, but not the one for the dress inspired by the "monk's robe with no end"? I saw it on eBay, but the bidding had gone up above $200 for that one and I gave up. We took a visitor from NY and one of Iris' playmates to brunch in Hermosa Beach yesterday. The television weather reports in Los Angeles tend to overplay rain predictions under the impression that it improves their ratings*. I told Bad Dad to ignore the TV and hang the laundry out on the line. Notice Iris is enjoying her hot chocolate al fresco. A pair of pelicans took turns divebombing for fish in the same spot. * The American Meteorological Society published a study in our monthly bulletin examining the accuracy of TV weather forecasts. While most news markets exaggerate the probability of rain, the LA market was most egregious. Could it be because rain is such a rare event here? This cereus bloomed April 28, 2009. Judging by the number of buds, it seems to prefer the NE corner of our house to the SW corner. I don't know why, because both sites are shady and sheltered. I thought the cereus is blooming rather early; they are generally summer bloomers. But, Are you cereus? posted pictures of blooming cereus from February and April visits to the Huntington gardens. We seem to get continuous crops of columbines. They self sow throughout the year. I can't complain about such pretty garden volunteers. Notice the attractive Swiss chard leaves. This orchid has been blooming continuously since October 2008. This one started blooming the last week of April 2009.